After completing her Bachelor of Commerce at McMaster University, Laura obtained her CA designation in 1983 while articling with Clarkson Gordon (now Ernst & Young LLP). Laura worked with a number of large public accounting firms in Hamilton, Toronto and Calgary before settling into the Expatriate Tax Group as a Senior Tax Manager with Ernst & Young in Calgary in 1999. In her endeavours, Laura [accumulated] experience in small business tax planning, owner/operator compensation strategies, estate planning and Canadian and US cross-border tax planning. While I had the fun and privilege of working with her professionally on occasion during the last (and busiest) two weeks of the Canadian income tax "season", I also had the joy of being part of a small quilt group with her for a few years, and even after I moved out of the city, we corresponded at Christmas. That said, I didn't know she was ill until I was told of her death. This week being the memory week of my husband's passing, I find myself particularly reflective about Laura, her precise, skilled quilting, and her personality's combination of laid-back intensity. My heart's thoughts and prayers are with her husband, two children and mother at this time. Laura was only 53, as was my Howard when he died. There is particular pain created by losing a spouse or a parent -- and in losing a child, as both Laura's mother and my mother-in-law did. I know and understand only in part -- witnessing an essential part of the human condition, "...through [that] glass darkly", and thus being inarticulate to express how it touches my heart, the heart of a relative stranger to Laura's family. 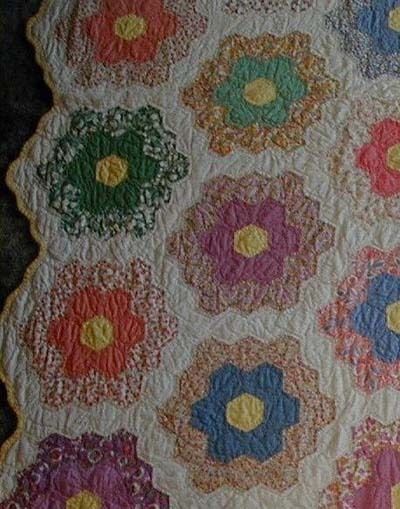 Years ago, three of us from the quilt group took a class in English paper piecing with a view to making a small sampler quilt. While I enjoy the process, mine remains partially completed, in a box with all the parts and pieces. I wouldn't be surprised if Sue's is in the same state. However, I distinctly remember seeing Laura's when she had it finished -- and beautifully so. Thank you, Laura, for your life: your kindness when my Howard died, your remembering others even after they've left your daily circle, your professional competence, your courage in the face of illness, and the love and fun you shared so generously with family and friends alike. We miss you, this side of Heaven. I am so sorry for your loss of your friend. 53 is too young.